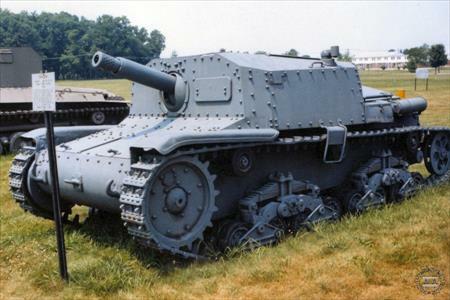 Can we Get a Chieftain video on the Italian Semovente 75/18? Honestly when it comes to Italian WW2 Tanks and Vehicles people only talk about their Medium Tanks or Light tanks, and "how bad they were". which isn't entirely true as the Doctrine and what purposes they were built for are never considered in discussions, but that's a topic for another time so i digress. Yet nobody ever talks about their Tank Destroyers/SPG's. Why is that? These "Semovente" were some of if not the best SPG's of the war yet nobody ever seems to talk about them. Hell even in the Video Wargaming did on "Italian Armor" they never once mentioned them. Why? Is it because the Semovente da 75/18 using its HEAT rounds cut through the front of Shermans and Matildas like butter? I can't ever find a video out there that properly covers them in great detail and it honestly saddens me. "This self-propelled gun was built with riveted steel plates, which were thicker but also less sloped than in the original tank (50 mm as against 42 mm max). Frontal armour was almost vertical, but it consisted of two plates that strengthened it when compared to a simple homogeneous steel plate. The vehicle had its crew compartment and drive section forward, in a large and low casemate; the engine was situated behind it, in a separate structure (typical of Italian designs), which was sloped and somewhat smaller, and had inspection panels on the roof. The chassis was identical to that of M13/40 tanks, with eight small wheels in four trolleys which were joined in pairs by two arms. Suspensions were of the leaf spring type, which was reliable but didn't allow for high speeds. The transmission was located in the forward part of the vehicle, and the crew consisted of only three members: driver, loader/radio operator, and tank commander/gunner. The main gun was a derivative of a 75 mm L/18 gun, itself a quite modern divisional artillery piece. It was 18 calibers long, with 40° traverse and −12/+22° elevation. The gun had a muzzle brake, and there were several observation and aiming systems (binoculars, periscopes and others) for the crew. The low muzzle velocity (around 450 m/s) meant a relative short range, 9,500 m at best elevation of 45 degrees, but the installation allowed only 22° and so the range was limited to around 7–8 km." "Although these machines were not widely known, the vehicle performed well in its role. Though it was technically similar to the StuG III, it had a totally different role, serving as divisional artillery instead of a pure assault gun. The organic structure consisted of two artillery groups for every armored division, with two batteries each (four 75/18 each and a command vehicle). The total was of 18 75 mm L/18 (included two in reserve) and 9 command vehicles, which were characterized by additional radio equipment and a Breda 13.2 mm heavy machine gun mounted instead of the main gun." "The Semovente da 75/18s were deployed in the North African campaign and during the Allied invasion of Sicily, alongside M tank units to provide additional firepower. Despite the fact that they were not designed to fight other tanks, their 75 mm howitzer proved ideal (thanks to its low muzzle velocity) for firing HEAT shells; its 5.2 kg HEAT shell ("Effetto Pronto" in Italian) could pierce 100 mm of armor at 500 meters, and could thus defeat tanks such as the US built M3 Grant and M4 Sherman used by the British Army. As such, these machines were responsible for many of the successes by the Italian armored troops during 1942–43, when the medium tanks (all armed with a 47 mm gun) were no longer effective." 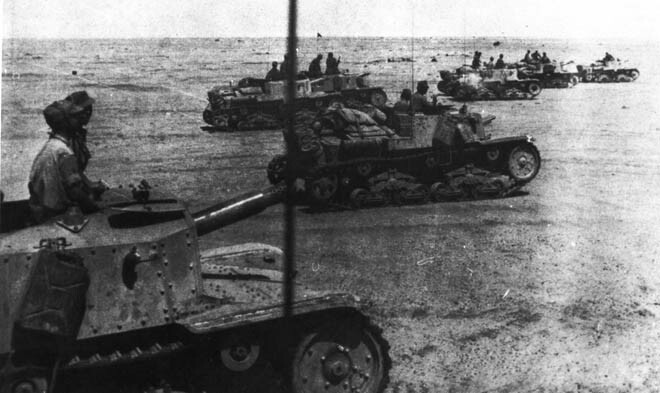 "The most successful action fought by Semovente da 75/18 took place on 10 June 1942, south of Knightsbridge, during the Battle of Gazala. Thirty M3 Grant and ten M3 Stuart of 1st and 6th Royal Tank Regiment attacked a position held by the Ariete division but were repelled by Semovente da 75/18s as well as some M13/40s and gun trucks, losing three Grants and two Stuarts from 6th Royal Tank Regiment and twelve Grants and three Stuarts from 1st Royal Tank Regiment. The Italians lost two M13/40s"
"Despite its limitations (namely its cramped interior and the insufficiently powerful engine in the M40 and M41 variants), the Semovente da 75/18 proved successful both in the direct support role and in anti-tank fighting; its main advantages, other than their sheer firepower, was in its thicker armor (relative to the medium tanks) and lower silhouette that made it more difficult to hit. Due to these features, the Semovente da 75/18 has been regarded as the only Italian armored fighting vehicle to be seriously feared by Allied tank crews, despite the fact that it was originally conceived for a totally different role." Because of what's stated above I've Always been left wondering why hasn't the Chieftain done a video on them yet? Find me one in good condition, if you can. War Thunder has certainly made a big fuss about them. Did some video that covered them a while back. Jeeez, even I don't call it "the best" SPG. It was decent enough for its purpose, but damn. Sometimes I wonder if I've let this Pastaboo bloodcult thing get a bit out of control. On the one hand I'm oh so proud and on the other hand I'm still so very proud. Edited by RanLSX, Mar 23 2019 - 18:36. Edited by TheDgamesD, Mar 29 2019 - 02:25.